The new Fujifilm FinePix Z1000EXR is a stylish digital camera with a lot of features packed into its slim frame. Sporting a 16 megapixel back-illuminated (BSI) EXR-CMOS sensor, 5x optical zoom, 3.5 inch touch screen LCD, Wireless Image Transfer to smartphones and social networking sites, full 1080p HD movie capture with stereo sound, sensor shift image stabilisation, top ISO 6400 sensitivity, 1600% dynamic range and up to 12 frames per second continuous shooting, on paper the Z1000EXR seems to be too good to be true. 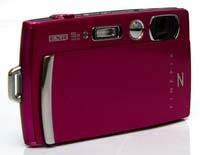 The Fujifilm FinePix Z1000EXR costs £199.99 / $279.95 and is available in pink, white or green. The Z1000EXR's lens sits in the top right of the camera (if viewed from the front) with a large plate of metal sliding over it to protect it and also power the camera on and off. The review model that we tested was the bright pink version which has a very smooth and glossy coating. With only a small, super-slim silver handgrip on the front, this does make the Z1000EXR rather difficult to hold steady. A clever addition to the Z1000EXR is a small mirror, essentially a poor man's version of the secondary LCD screen found on the front of Samsung Dual-View cameras, but proving almost as effective in practice. The AF assist lamp and built-in flash complete front of the Z1000EXR. On the Fujifilm FinePix Z1000EXR's top plate, there's the shutter release with the zoom switch wrapped around it and a direct video record button for those candid moments so you don't have to go into menus and switch on the video mode first. The Z1000EXR records video in the H.264 format and you can tag videos in camera for easy upload to YouTube, something that the younger generation may prefer but that's not to say that it's off limits to anyone else. A new addition to the top of the camera is a small playback button. One of the most important new features on the Z1000EXR is the Wireless Image Transfer functionality. By installing the free Photo Receiver app on your smartphone, connecting to the camera's wi-fi network, then pressing Connect simultaneously on both devices, you can transfer images from the Z1000EXR to an Android or iOS device and then edit and share the images as you wish. Up to 30 images can be transferred at one time. In practice it's a little laborious to get started, and we'd have also liked to be able to connect to any wi-fi network, not just a smartphone, but it does at least provide an easy way to get the images off the camera and onto a device or website of your choice. The Z1000EXR has a BSI EXR-CMOS sensor. BSI stands for Back Side Illuminated which means that all the circuitry that normally surrounds each pixel has been placed on the back of the sensor. This technique exposes the full sensor to light meaning that it's more responsive in low light situations and a lower ISO can therefore be used. The back of the sensor isn't actually illuminated, the sensor gets it's name from when it's fitted to the camera. Because the circuitry is on the back, it looks as though the sensor is fitted backwards so the back side gets illuminated by light from the lens. EXR is a processor and sensor system designed to increase the resolution, produce better colours, lower noise and be an all round good egg. It's certainly shown a lot of promise in the past with the cameras that have been fitted with it. For those of you that aren't photographically astute, there are two types of sensor that are frequently used in digital cameras. The traditional variety is the CCD (Charge Coupled Device) offering a sharp image but has a higher fuel consumption than CMOS (Complementary Metal Oxide Semiconductor) which gives a slightly softer result but is more efficient. Fujifilm have opted for the CMOS in the Z1000EXR believing that it works better with the EXR processor. Fujifilm's EXR sensor can be utilized in one of three ways by the photographer. There's a choice between shooting at full 16 megapixel resolution in High Resolution (HR) mode, or an 8 megapixel image in the Low Noise (SN) mode for shooting without flash in low light conditions, or the Dynamic Range (DR) mode to achieve an optimal balance between shadows and highlights. The latter offers five strengths ranging from 100-1600%. If you can't decide which is best for a chosen scene or subject, then just leave the camera on the scene-detecting EXR Automatic Mode and let it choose for itself. The Pro Low-light mode uses multi-bracketing technology, taking a series of four high sensitivity/low-noise shots in quick succession and combining them into an image with less noise than the single exposures. 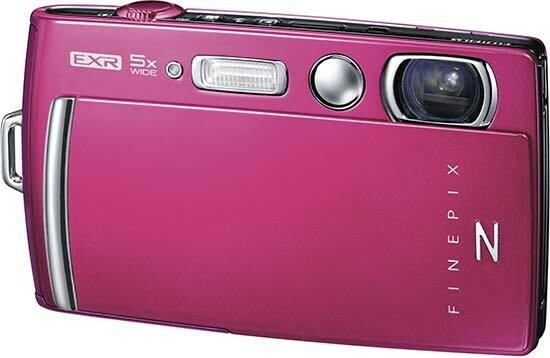 Thanks to the 5x optical zoom of the Fujifilm FinePix Z1000EXR being internal, the body of the camera is very slim. It makes the camera easily pocketable and of course should a child get hold of it, there's no chance of them breaking the zoom barrel. All other buttons and functions except for the three controls on the top of the camera have been incorporated into the touch screen interface, so if you're a fan of external controls then this isn't the camera for you. The build quality of the Z1000EXR is very good. The camera feels solid to hold and the large plate that covers the lens should provide exceptional protection. The only thinga we're disappointed in are located on the bottom of the camera - there's a cheap plastic tripod bush and the battery door is quite flimsy. Generally, higher specification cameras have a metal tripod bush and it's kind of like a status symbol with manufacturers. With regards to the battery door, it's not that problematic but it's not the easiest door to open and that gives us concern with long time usage. Fujifilm have changed the way that their menus work these days. Before, it was a simple combination of shooting menu and set up menu with a separate playback menu in that mode. While it's technically the same at its base elements, the structure of it has changed so it seems more difficult to operate. The modes are now found by pressing the mode icon on the touchscreen in the top left corner. This menu remains in the top left regardless of the orientation although other modes will take different places when the camera is vertical. This menu is where you'll choose whether you want the camera in auto, scene recognition, EXR, touch & shoot, scenes, natural & flash or motion panorama. Recently Fujifilm released a new panoramic mode that allowed much easier alignment and stitching of pictures to create panoramas but it still wasn't as easy as the Sony Sweep Panorama. Motion Panorama is Fujifilm's answer to Sweep Panorama. It takes a series of images while you move the camera in the direction you want to record. It also features a yellow line to keep you aligned. The menu is still easy to use though, it's just evolved to a more advanced state of the extremely simple menu systems that they became famous for a few years ago. The Z1000EXR has an extensive array of options in its Playback menu The picture is displayed in the centre of the touch screen with ten buttons down the sides of the picture in 2 groups of 5. From this point it's possible to favourite your pictures by giving them a star rating, search for pictures using date, face recognition information (faces have to have been registered in the camera database before this will work), favourites, scene mode, type of data or by upload mark (YouTube or Facebook). Along with the camera, inside the box you'll find a rechargeable lithium ion battery and a dedicated charger which comes with a 3 pin attachment that slides on to the charger. The lack of lead could reduce the amount of places that it can be plugged in due to its size and shape. There's also a USB lead and small wrist strap to prevent the camera from being dropped. In the software package there's a paper based quick start guide, warranty booklet and on the driver CD is MyFinePix Studio for both Windows and Mac. The full owners manual is also on the disc.